Some 60 billion messages are sent over the WhatsApp chat platform every day. One of the reasons for the service’s massive popularity is that it lets users send and receive as many media-rich messages as they want, which – as long as they’ve limited WhatsApp’s use of their cellular data plan – costs them next to nothing. That’s great news for senders, but one of the drawbacks of receiving multiple images and video clips from your WhatsApp contacts is that they’re automatically saved to your iPhone’s Photo Library. Apart from being an unwelcome sight in your personal Camera Roll, they can start to take up valuable storage space. Fortunately, you can easily prevent this default behavior by following the steps below. Once you’ve turned off the above setting in WhatsApp, you can still manually opt to save individual media files that you receive in a chat thread. If your iPhone supports 3D Touch, simply hard press on the photo or video clip in question and swipe up to reveal the Save option. Alternatively, you can access the Save option by tapping the photo or clip and selecting the Share icon in the lower left of the screen. 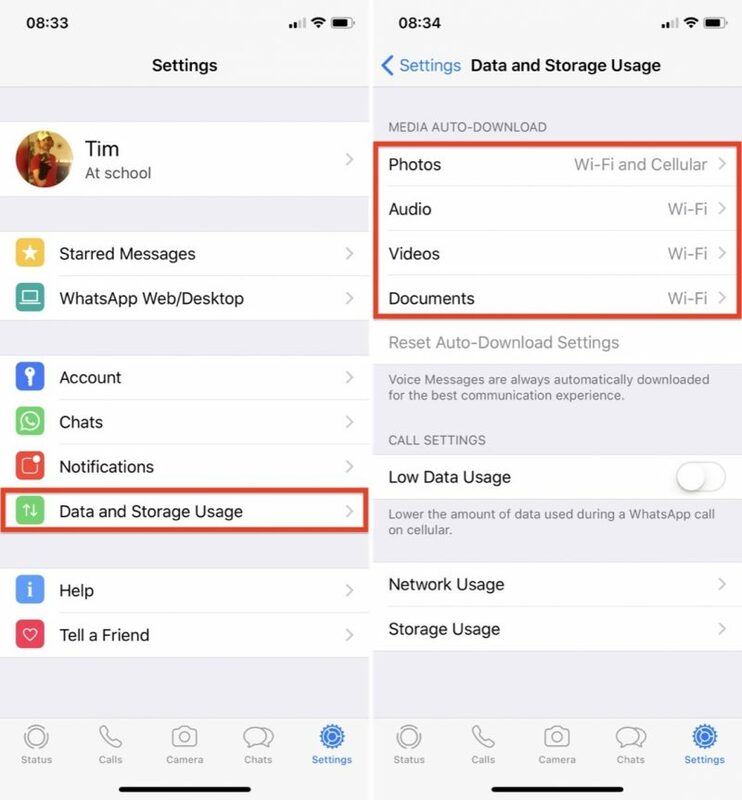 If receiving images or video over WhatsApp is sapping your cellular data when you’re out and about, you can prevent them from downloading to your iPhone until you’re safely back in range of a Wi-Fi connection. To do so, return to WhatsApp’s Settings tab and select Data and Storage Usage. The options under Media Auto-Download let you dictate which types of media can be downloaded and under what circumstances. Make sure that the media types you’re happy to wait for are set to Wi-Fi.